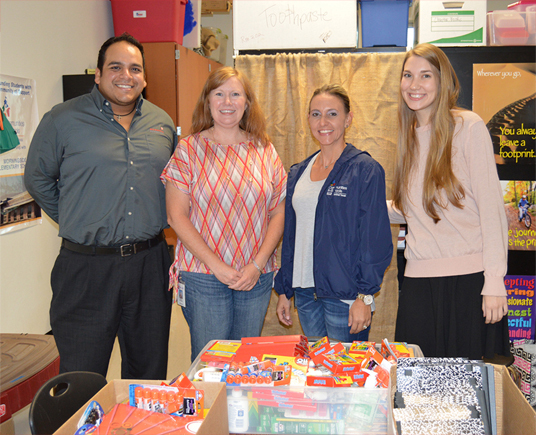 San Antonio, Texas — O’Connell Robertson’s San Antonio office collected school supplies to donate to Morningside Elementary School in Comal ISD. More than three boxes of supplies were presented to the school in time for the first day of classes. Comal ISD issued a press release providing more information on the donation. Pictured are Danny Cornejo, O’Connell Robertson’s regional marketing and business development coordinator; Kathy Thomas, principal of Morningside Elementary School; Shelley Betsworth, project director for Communities in Schools; and Jayme Green, an architecture intern with O’Connell Robertson.